Each photo has a coordinating number attached. Please make sure you note this item number to our distributor upon purchasing since each case is unique! Please welcome the newest member to our case line- the SE56 Micro Case. 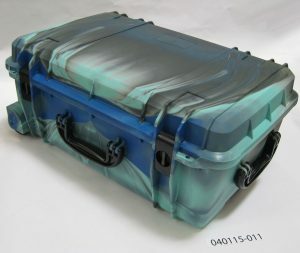 This small but mighty case is high impact resistant, watertight, crushproof, and dustproof. Ideal for any outdoor excursion or the next OEM project. 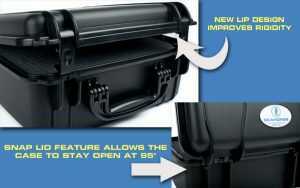 Outside features rust proof hinges and a plastic keyed latch. Don’t feel like locking it? You can also use the safety twist feature to secure your valuables. Comes with a carabiner loop that holds up to 175 lbs. and 2 inch strap attachments on each end. Inside, it features a shock absorbent padded liner and a removable mesh lid web, providing not only extra protection but more storage capacity as well. With a pressure release valve hidden under the latch, it is still proven to be submersible for 1 meter up to 30 minutes. The external dimensions are 9.48″ x 5.8″ x 2.77″, weighs 1.31 lbs and now available in all 7 colors:Blue,Orange, Green, Red, Yellow, Black and Translucent Gray. Click on “Where to Buy” to purchase one of these cases from our distributors today. We had a lot of positive feedback on the lip design of the SE630 and the redesigned SE920. So much so, that we have decided to tweak the SE520 as well. We have added some material to the front lip, improving the rigidity and appearance of the case. This new feature improves the appearance of the case.